Unfortunately, the excesses of the Futura seemed woefully at odds with the design ethics of the Sixties. And so it happened that the unwanted car ended up in the possession of George Barris. 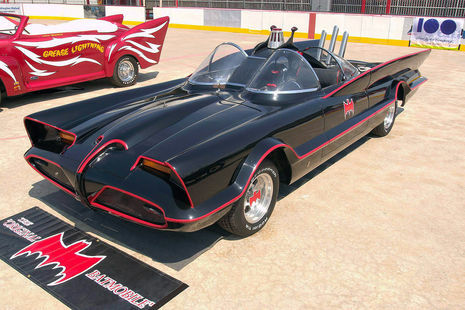 In 1965, Barris was commissioned to build the Batmobile for ABC's upcoming Batman TV series. But because the show was about to go into production, he had only three weeks to build it. He quickly realized it didn't take much work to modify the Futura for the part. While retaining the chassis and the basic shape of the car, Barris overhauled the nose and tail with numerous bat like shapes and references. Barris in '66 would assemble 3 more Batmobiles using bodies based on the prototype mold and built on a production car chassis. In the late summer of 1965, an all-new Batman TV series was gearing up, with Dean Jeffries hired to build a Batmobile for the show. When the show's production schedule was moved up, Jeffries had to pass on the job, which then went to custom car builder George Barris. With merely three weeks to build the car, Barris decided to use the Ford Motor Company's abandoned Futura concept car as a basis for what would go on to become one of the most famous cars in the world. The Futura worked perfectly as a Batmobile, as it had many "bat" features built into the design already, such as the long fins and bubble canopies. According to Barris, he further enhanced the theme by converting the nose into an integrated bat mask, a first for the car. He also opened the wheel wells, and modified the Futura's fins into subtle bat wings by extending their leading edges into the doors and scalloping the trailing edges. 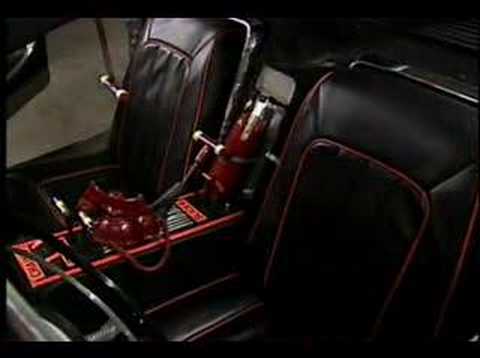 Once bodywork was complete, the car was painted gloss black with red trim to accentuate the various lines of he car. Three replicas were eventually built by Barris' shop, though only one appeared on the show itself. The car featured an impressive array of bat-gadgets. In addition to the "atomic turbine engine" (the car was actually powered by a blueprinted Ford V8), the car had a nose-mounted chain slicer, lasers, rockets, an on-board telephone, radar, dash monitor, on-board computer, and police beacon. If needed, the Batmobile is capable of a quick 180° "bat-turn" thanks to two rear-mounted 10' parachutes, and the it is equipped with a smoke emitter and a nail spreader to discourage pursuit. Some changes were made during the run of the series, including different license plates, a change in steering wheel, and the addition of extra gadgets such as the rear-facing camera and battering ram.